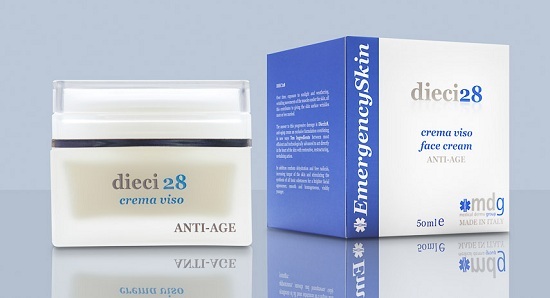 Dieci28 is antiage cream with the exclusive formulation that associates in new ways Ten Active principles the most efficient and technologically advanced to act directly in the heart of the skin with one restoring, restructuring, revitalizing action. Also fights the dehydration and free radicals, increasing the skin turgor and stimulating the synthesis of all essential ingredients for a brighter facial appearance, polished and uniform, visibly jounger. having wrinkles, dry and not very bright and compact skin. Apply twice a day (morning/evening) taking a quantity of cream with the spatula, apply with fingers on face and on neck, by massaging effectively from the inside of face, to the outside, till complete absorption. For a particularly effective treatment action, is reccomended the combination with Hyaluronic3g face serum, applied on clean skin before dieci28 cream. Continue the treatment in the time up to a visible improvement in condition of the skin. VITAMIN E: strong antioxidant, blocks the free radicals due to skin aging. Has a strong elasticizing and protective capacity. VITAMIN H or BIOTIN: it inserts in the metabolic balances by stimulating the cells to be “younger”. BACILLUS FERMENT: light detector. From a biofermentation process, an active substance acting with an enzymatic exfoliation action, removing gently the top layer of the epidermis, for more uniform and luminous skin. COENZYME Q10: synthesized naturally in our cells, acts as a promoter of the physiological energetic and antioxidant processes, so providing for the skin a valid support, both in contrastin the aging process against agressive agents, such as free radicals, which produce cellular damages. TAURINE: sulphide aminoacid present in our body, but whose quantity decreases with age. The provision of Taurine is used to set the right tone of energy to the skin and to combat aging. INOSITOL: also known as vitamin B7 is a cyclic sugar stimulating the cell metabolism for one activation action of cellular functions, which slow down with aging. HYALURONIC ACID: high molecular weight, Hydro-Complexing effect, thanks to its strong moisturizing power, has the ability of complexing many water molecules (up to 1000 times its own weight) gives firmness and tone to skin tissue. I t creates a film-barrier that prevents the drying of the skin and increases the protection and hydration in the time. HYALURONIC ACID: low molecular weight, Hydro-Adjusting effect, acts more efficiently from inside by regulating the hydro-balance of the skin. By acting as support to the deepest epidermal layers and stimulating collagen synthesis, it gives a firming and toning effect. The result of this antiaging action is one hydrated, young and elastic skin. FOLIC ACID or Vitamin B9: prevents and counteracts the damages caused by aging, by acting as protective of the elastic structures of the skin as DNA repair. ALMONDS OIL: emollient very soft, helps the skin to maintain own hydration and elasticity. Water, Sweet Almond Oil Polyglyceryl-6 Esters, Ethylhexyl Palmitate, Methylpropanediol, Prunus Amygdalus, Dulcis (Sweet Almond) Oil, Octyldodecanol, Glycerin, Behenyl Dimethicone, Behenyl alcohol, Glyceryl Stearate, Caprylyl Glycol, Sodium Polyacrylate, Sodium Stearoyl Glutamate, Taurine, Folic Aciod, Inositol, Phenylpropanol, Sodium Hyaluronate, Hydroxypropyl Guar, Disodium Edta, Tocopheryl Acetate, Propylene Glycol, Ybiquinone, Lecithin, Biotin, Bacillus Ferment, Tocopherol, Ascorbyl Palmitate, Citric Acid. “Dieci28 is a cream that associates an unprecedented ten active principles among the most effective and technologically advanced acting directlly in the heart of the skin. It has a restoring restructuring and revitalizing action, fights against deydration and free radicals, increasing skin turgor and stimulating the synthesis of all fundamental substances. This action gives a brighter look to the face, making it smooth, uniform and visibly younger.